Adam Giddens, left, confessed to the robbery of numerous weapons at a home in Bunnell a year ago, and implicated Dane McReynolds, who had fled to Arkansas. Giddens was sentenced to three years in prison in May. 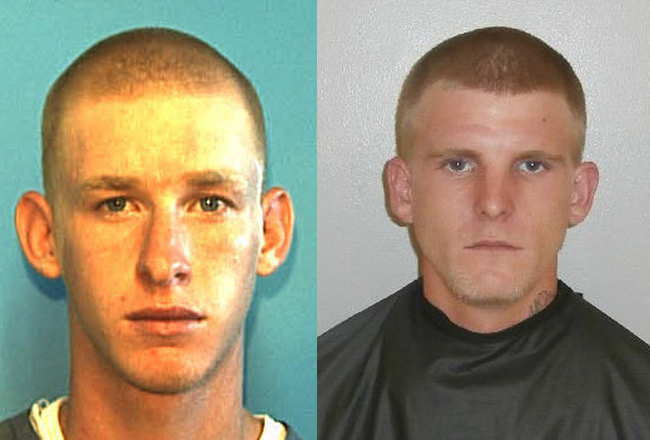 Flagler County authorities have been after Dane McReynolds for a year and 21 days, ever since he and a friend were accused of carrying out an armed robbery at a house on County Road 205 in Bunnell on July 1, 2012. His friend, Adam Giddens, formerly of 2187 Rosewood St. in the Mondex, or Daytona North, confessed to the burglary a year ago, pleaded no contest, and was sentenced to three years in prison on May 6 by Flagler County Circuit Judge J. David Walsh. Giddens is currently at the Lancaster work camp near Trenton, west of Gainesville. McReynolds had fled Flagler, and was believed to be somewhere in Arkansas. 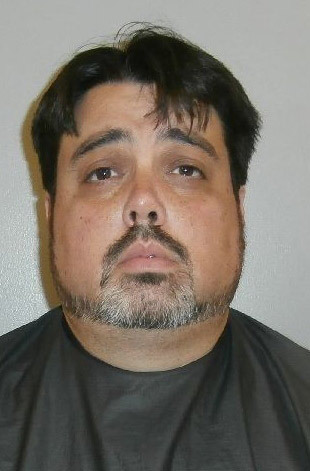 On Saturday, after a short stand-off with Flagler County Sheriff’s deputies at a house at 2570 County Road 304, McReynolds was arrested and booked at the Flagler County jail, where he’s been booked 15 previous times going back to 2009. He is not yet 23. He’s being held on $50,000 bond. The armed burglary is only one of the charges, on which he was indicted by the state attorney last Sept. 4. He also faces charges of grand theft, marijuana possession, resisting arrest, driving on a suspended license, failure to appear and trespassing. His previous arrests have resulted from similar charges as well as one escape attempt, burglary and alcohol possession while under 21. The armed robbery charge is the most serious on his record. It stems from the July 1, 2012 incident when McReynolds allegedly was with Giddens when the pair broke into the home of Samuel and Elaine Tilton on County Road 205 and stole possessions valued at between $5,000 and $10,000. Those included a camouflage bow, a Ruger .260 Hawkeye rifle, a Browning rifle and scope, a 20 gauge Remington shotgun, a .22 Remington rifle with scope, a .22 caliber Colt pistol, a white safe containing passports, jewelry, an iPhone, an iPod and some $1,300 in cash. Giddens’s fingerprints were found on the master bedroom window, the point of entry. When Giddens was interviewed by an investigator in mid-July 2012, he waived his Miranda rights and confessed to the robbery, and that he kept several of the weapons for himself. Those weapons were recovered after the confession. The remaining property was believed to be in McReynolds’s possession. About a half hour after the armed robbery took place last year, both men were arrested by the Bunnell police department on minor charges: Giddens had no driver’s license, he was charged with reckless driving and possessing alcohol while under 21, and McReynolds was charged with possession of less than 20 grams of marijuana. Bond was set at $1,000 for McReynolds, $500 for Giddens. In an unrelated case, 37-year old Carmelo David Ortega of 12 Woodcrest Lane in Palm Coast was arrested on three counts of exploitation of the elderly and one count of organized scheming to defraud Friday. He was booked into the Flagler County Jail on the warrant out of St. Johns County. The investigation began by St. Johns County Financial Crimes Detective Henry Miller in April 2013 when three customers of a Wells Fargo branch discovered missing funds from their accounts after meeting with Ortega, who was a bank employee. Ortega is charged with fraudulently withdrawing cash from the accounts of three victims (Ages 64, 84 & 86) on three occasions while he was serving as their personal banker. The suspect is accused of removing $6,000 from the three victims. The detective obtained an arrest warrant for Ortega last Thursday and he was located and arrested by Flagler County Sheriff’s Office on Friday. He has since been released after posting $10,000 bond. The investigation is continuing. These guys are killing this town and this state. Time for a change in the laws. Time for a Three Strikes Law if the crime involves a weapon? Three Strikes and you’re a lifer, no early out. Another shining example of the Flagler County Justice System’s revolving door policies! 15 times in jail and only 23 years old!! I’d say its time to elect some judges who will give garbage like this maximum sentences. McReynolds has been arrested 16 times in Flagler county, has been hiding from charges of armed burglary (among others) for a year, resisted arrest and already has an escape attempt. Shouldn’t the judge make it a little bit harder for this guy to get out of jail? @ Rick Belhumeur: Either that, or we get ourselves some new judges. Oh my God – they’re WHITE! And one with with big auricles too. He must have superhuman hearing. Very handy for prison life. Talk about contempt for the law–what a nerve. Bond ! Really. Bond ! In all of my personal experiences on both sides of the bars if I have ever seen a NO BOND case this is it. What happened to 10-20-Life & 3 strikes and your out? Our Tallhassee legislators used to crow about how tough on crime they were while they referenced these very laws. The man is accused of stealing 6 times the money he needed to make a $10,000 bond. He is left with $5,000 get away money. They’re white and weren’t wearing hoodies at the time, so, no problem. These guys look like the people who run the systems kids, of course they get the benefit of the doubt. THOSE stats don’t show up because they get cut breaks more than anyone else. 36 months for armed robbery?…..get serious! Crap, I moved out of Palm Coast to get away from this, and now it’s just up the street. If any of these clowns get into my house, you will find out a criminal is a criminal, and will be treated as such no matter what the skin tone. Carmelo Ortega looks like a sad caricature. Remember Sad Sack? Mr. Ortega has him beat by a mile.